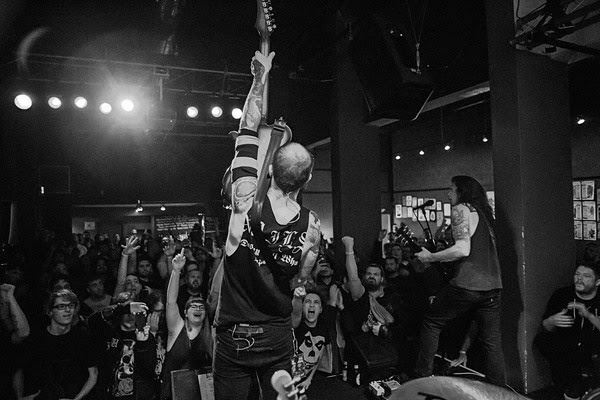 BARONESS, the Savannah, Georgia metal band which kicks off a five-week North American tour later this month, has released a video for the song "Shock Me". Filmed in rural Pennsylvania, the clip — which was directed by Don Tyler and John Baizley, with art direction by Karen Jerzyk — brings to life a number of elements from the incredible artwork BARONESS albums are known for. BARONESS has also named the openers for the highly anticipated tour with YOUTH CODE on all non-festival U.S. dates, MUTOID MAN opening shows in Eastern Canada and HEIRESS handling dates in Western Canada. The tour, which includes stops at the Sasquatch, Project Pabst and Shaky Knees festivals, kicks off on April 29 at the Royale in Boston before wrapping up at the Fonda Theatre in Los Angeles on June 3. The band has also been confirmed for Psycho Las Vegas on August 28. BARONESS recently wrapped up an extensive European tour, which was hailed as "defiant, dominant and full of heart" (Prog) and a "devilishly complex take on power rock 'n' roll" (London In Stereo). BARONESS is continuing to tour in support of its fourth album, "Purple", which was released in December through Abraxan Hymns.